SCVHistory.com LW3092 | Film-Arts | Harry Carey Jr. Featured in 'Something Big' (National General 1971). 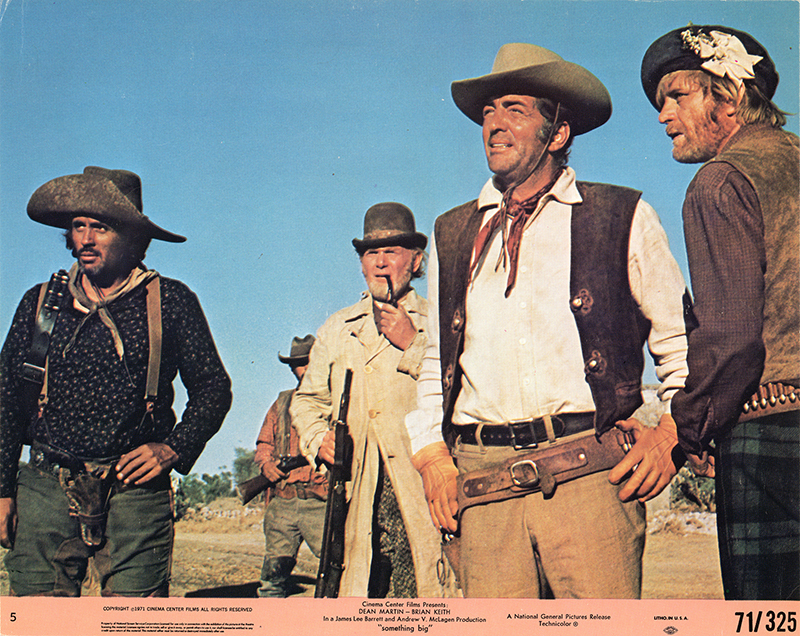 > HARRY CAREY RANCH > HARRY CAREY JR.
Harry Carey Jr. in "Something Big"
Saugus native Harry Carey Jr. (center, with pipe) has a little role in "Something Big," a 1971 Dean Martin vehicle from National General Pictures. 8x10-inch photographic lobby card (as opposed to a standard 11x14-inch printed lobby card). Shot on location in Durango, Mexico, "Something Big" co-stars Brian Keith, Carol White, Honor Blackman and the equestrian impresario Ben Johnson. Also featured: Albert Salmi, Don Knight, Joyce Van Patten, Denver Pyle, Merlin Olsen, Robert Donner, Judi Meredith, Edward Faulkner, Paul Fix, Armand Alzamora, David Huddleston, Bob Steele, Shirleena Manchur, José Ángel Espinosa "Ferrusquilla," Juan García, Bob Gravage, Chuck Hicks, John Kelly	, Enrique Lucero, Lupe Amador, Joe Gray and "Chico" Hernandez. [Adapted from harrycareyjr.com]: A Western character actor, Harry Carey Jr. is the son of early Western star Harry Carey Sr. and actress Olive Carey. He was born May 16, 1921, on his parents' ranch in San Francisquito Canyon (Saugus). He was nicknamed "Dobe" when he was a few hours old because his red hair reminded his father of the red soil in the area that was used to make adobe bricks. His sister, Ella, came along two years later (Nov. 16, 1923) and was nicknamed "Cappy" because her father, Harry Sr., was "captain" of his boat, the Ella Ada. Dobe and Cappy attended Newhall School when it was on Lyons Avenue near Newhall Avenue. As children they got to know some of the regular visitors to the Saugus ranch, such as actor William S. Hart, humorist-actor Will Rogers, painter Charles Russell and their parents' good friend, director John Ford — who was at the ranch the day Dobe was born. Dobe went to high school at Black Foxe Military Institute in Hollywood with the sons of other Hollywood personalities. As a young man he yearned to be a singer. While taking voice lessons in New York City in 1939 he got his first paying job at the New York World's Fair in the show, "Railroads on Parade" — not as a singer, but as a horseback rider, something he learned to do with great skill on the Saugus ranch. In 1941 he was hired by NBC as a page boy and then entered in the Navy. He shipped out but was quickly recalled to Washington by John Ford, who was working for the OSS — the predecessor to the CIA. Under Ford's "direction," Dobe developed Allied and captured German spy film for the war effort. In 1944, while still in the Navy, Dobe married Marilyn Fix, the daughter of actor Paul Fix. She would remain his lifelong companion and gave him four children. In 1946, Dobe followed his father into the motion picture business, landing a role in a "B" movie, "Rolling Home." Next came a featured role in Raoul Walsh's "Pursued," and he was on his way. In 1947 he made his first of 11 films with John Wayne, appearing in the Howard Hawks classic, "Red River." Harry Sr. appeared in the film, as well, although they did not appear on camera together. Senior never saw it; it was released posthumously in 1948. In that year Ford remade "3 Godfathers," which he had made in 1919 with Harry Sr. This time Junior shared the lead (and sang) with Duke Wayne and Mexican box-office sensation Pedro Armendariz. It was his first of nine films as a member of the John Ford Stock Company — the others being "She Wore a Yellow Ribbon," "Wagonmaster," "Rio Grande" (in which he did some Roman riding, standing on two horses while galloping through Monument Valley), "The Searchers," "Two Rode Together," "The Long Gray Line," "Mister Roberts" and "Cheyenne Autumn." Harry Carey Jr. appeared in nearly 100 films and hundreds of television episodes, including numerous appearances in the Mickey Mouse Club series "The Adventures of Spin and Marty" (shot on the Walt Disney Co.'s Golden Oak Ranch in Placerita Canyon), "Gunsmoke" (early episodes shot on Gene Autry's Melody Ranch in Placerita Canyon), "Rawhide" (ditto) and others. He has made two documentaries, "Legends of the American West" and "John Ford's America" and is the author of the book, "Company of Heroes: My Life As an Actor in the John Ford Stock Company," available in hard- and softcover editions. Dobe and Marilyn — and Cappy — live in Santa Barbara. Update: Dobe died Dec. 28, 2012. "B.J. and the Bear" (1979) ... in episode: "Fire In The Hole"
LW3092: 9600 dpi jpeg from original photo card purchased 2017 by Leon Worden.